Month: February 2011 - ThirtySevenWest ThirtySevenWest - Creative ideas about personalized custom ribbons, woven tags and labels, personalized gifts and more!!! Valentine’s Day is about the celebration of love. Did you know that people in different countries celebrate it differently? Some celebrations might even surprise you! So, let’s take a short journey to these countries and find out some interesting facts about Valentine’s Day. According to legend (there are many legends as you will see), originally a holiday of Spring, St. Valentine’s Day started in Italy. Young people gathered together in the gardens and enjoyed listening to music and reading poetry. In time this tradition faded away. Couples that got engaged tried to tell everybody about their engagement on this day. A week or two before the holiday, stores were filled with sweets. China baskets and cups tied with ribbon and filled with delicious candies were quite popular. 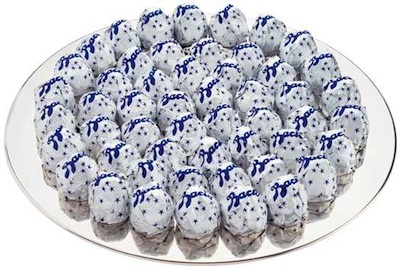 One of the favorites in Italy is “Baci Perugina” – hazelnuts covered with chocolate. Yummmm….Each of these elegantly wrapped candies has a short love letter inside that is translated into four different languages. Valentine’s Day is very popular in Australia and not just for lovers! Australians use this holiday to better relationships with their family, meet with friends and talk to colleagues. They say that during Gold Rush in Australia, when citizens of Ballarat became very rich, they started ordering very expensive Valentines. The most expensive were: personalized satin pillows, perfumes and birds of paradise. In England, on February 14th, unmarried girls get up before the sunrise, stand next to the window and look at the men walking by. They believe that the first man they see is their destiny. 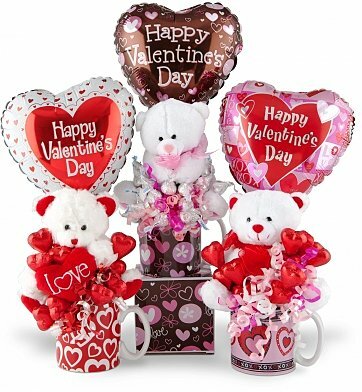 The most popular gifts on this day in England are heart-shaped candies, teddy bears and Valentine cards. In Germany, until recently St. Valentine was not considered to be the patron of love, but…the patron of mentally challenged people. Germans used to decorate hospitals with scarlet ribbons and had special services in churches. 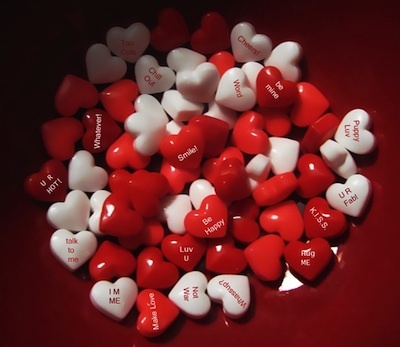 Now, it is known as a Valentinstag and it is celebrated in a way similar to America. It is customary for young men to give flowers to their sweethearts. In Holland it is not considered shameful if on this day a woman asks a man to marry her. If man says “no”, he has to give her a silk dress. Imagine that! In India, people recently started celebrating St. Valentine’s Day, and it becomes more popular each year. The spirit of this holiday is noticeable a couple of weeks before with TV, radio and newspapers start advertising 14th of February. Stores are filled with roses, angels, teddy bears, and are decorated with ribbons. A lot of people get engaged on this day. One of the most original celebrations of Valentine’s Day is in Japan. The highlight of the holiday is “The Loudest Confession of Love”. A special place is constructed, where people stand and one by one tell the whole world about their feelings for one another. Isn’t it interesting to note that on Valentine’s Day only men receive gifts? A month later, on March 14th, men give gifts to women. The most popular choice is white chocolate, because the 14th of March is called “White Day”. In Spain, the day of love is on May 1st, and in Brazil it is celebrated on June 12th. Valentine’s Day was brought to USA by the first immigrants from England and quickly became popular. Stores are filled with heart-shaped candies, cards, red ribbons, white ribbons, and pink ribbons, personalized gifts, chocolate and roses. A great personal touch to any gift is personalized ribbon with your sentiment and/or name on it whether it is sweet, silly, funny, unique, or a personal “code” you share. In Medieval Europe ladies used to give red ribbons to knights that participated in contests as a symbol of their love. The knights attached the ribbons and trinkets to their spears for good luck. In our time, people of all ages have a variety of gifts to choose from. Some prefer to personalize them by putting their names or the names of their loved ones on personalized ribbons, chocolates, and personalized gifts. 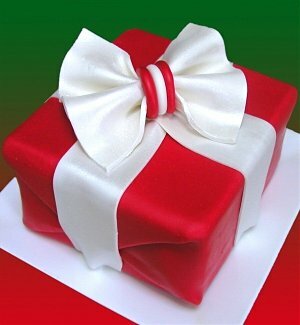 See some interesting ideas for embellishing your gifts and packages…. Please visit our website for some original gifts and ideas to make this and any holiday special! 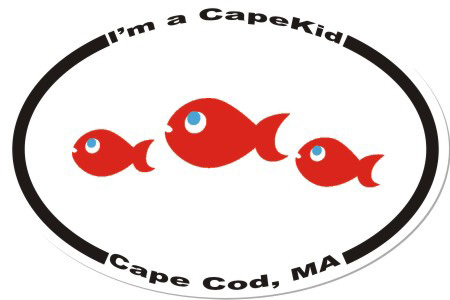 Lorrie Devlin, the founder and owner of CapeKids LLC, has managed to create an eco-friendly clothing company that reflects Cape Cod in whimsical themes designed by local artists exclusively for CapeKids. 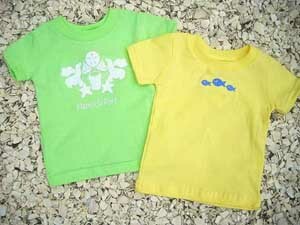 Capekids works with local artists, embroiderers and screeners to produce CapeKids clothing. The company promotes education and safety for kids at risk. We are very proud to supply our custom woven labels to company that makes the difference! Let us introduce you to Lorrie Devlin and learn more about this wonderful company. Thirty Seven West : “A lot of businesses we see today were born out of a need that hasn’t being met by the current market, thus innovative entrepreneurship. What prompted you to contact local artists, embroiderers and screeners to collaboratively produce a unique line of clothing catering to kids on Cape Cod”? Lorri Devlin: “With big retail chains blanketing much of America, it’s nearly impossible to discover a product that’s original and unique to a given area. 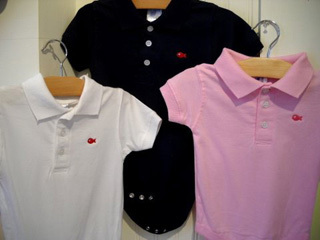 CapeKids clothing is a fresh alternative to generic products. Producing the work locally is a natural extension of this “home grown” philosophy. I looked to my own passions-a love of nature and a desire to connect kids to the natural world as inspiration to develop my brand. I grew up outdoors, playing in the fields, woods, and by the ocean. 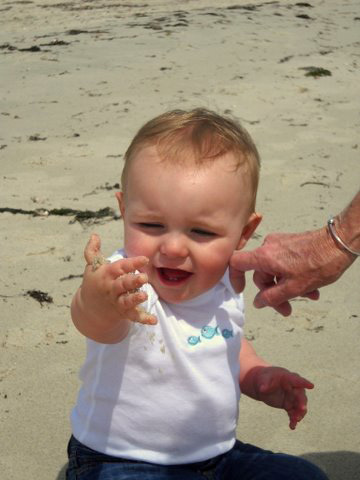 I want more kids to have that experience, wearing comfortable, fun CapeKids clothes”. Thirty Seven West: “Tell us how much fun as well as how much work it has been to reflect the lifestyle of Cape Cod with whimsical themes”. Lorri Devlin : “I love being immersed in the creative process of building CapeKids. Following a passion makes hard work feel more like fun. But it does require discipline and follow through. I live in one of the most beautiful places on earth-that’s a tremendous inspiration to my designs. It’s fun to think about what makes Cape Cod special for me, and to reflect that in my clothing. I love the classic look and feel of vintage seersucker and madras very Cape Cod”. Thirty Seven West: “Being a nurse interested in the well being of children as your inspiration, what prompted you to focus on education and safety for kids at risk? Is your definition of kids at risk being primarily poverty? Or does that include certain risks in hospitals”? Lorri Devlin: “Education empowers kids to achieve more, and expect more of themselves. Children at risk include kids who can’t read, kids who never play outside, kids who don’t have responsible role models. CapeKids donates clothing to shelters and hospitals. We donate to programs that promote literacy. As we grow, our philanthropy will include scholarships for kids who need help to obtain secondary education”. Thirty Seven West: “Has your vision changed any from the beginning? If so, how”? 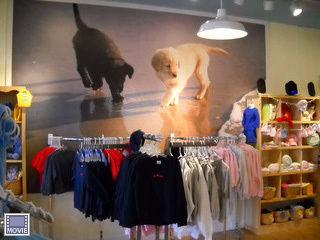 Lorri Devlin: “My vision has remained singular since the beginning- CapeKids is a socially responsible brand of eco-friendly, soft, nature- inspired clothing that lets kids be kids- and connects them to the wonders of the natural world”. Thirty Seven West : “What were some of the hardest things you faced when starting out with your business”? Lorri Devlin: “ Finding a balance between CapeKids and other responsibilities is an ongoing challenge. I’m blessed to have a loving family that believes in me. My husband Steve, our great sons/stepsons, and my sister Mary all support the CapeKids vision”. Thirty Seven West : “Do you have a story that you love to tell about your company? (e.g. maybe particular customer, that made your day, or something unforgettable about your business)”. 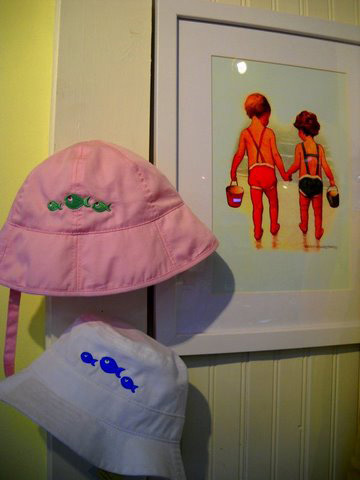 Lorri Devlin: “ I remember the first person ever to purchase a CapeKids item. She was visiting the U.S. from England, and purchased a sweet ruffle dress for her niece back home. Just like that, CapeKids was international”! Lorri Devlin: “I grew up in the 1970’s with a dad who installed enormous solar panels in the back yard to heat our water. We grew our own vegetables and never drove when we could walk. From the time I was a child, I was taught to tread softly on the earth. I honor my dad, and my planet, by keeping this value alive in my business”. Lorri Devlin: “It’s tricky sometimes. When I come home from school, it’s right to work on CapeKids. Fortunately I love both my jobs and as I mentioned, passion does not feel like work. Kids are a great source of inspiration for me! I will be featuring children’s art on a new line soon-watch for updates on my blog: www.CapeKidsTidalPool.com. And because you’re never too old to be a CapeKid, we’ve begun carrying grown up sizes, too”. Thirty Seven West: “Do you offer your customers personalization for the clothing for their children”? Lorri Devlin: “We provide custom embroidery upon request”. Thirty Seven West: “Not only you are busy with raising awareness and sales, but you are also making a difference by being actively involved in helping children in need. How can we let people know about the organizations you are supporting and ask them for their help”? Lorri Devlin: “I encourage everyone to give back in their own way. I taught an after school nature program recently -many of the children had never seen a milkweed plant, or a hawk before. Sharing your knowledge is priceless, and doesn’t cost a cent. I support the American Red Cross by donating to help provide blankets to victims of disaster. As we say at CapeKids, even a little fish can make a big splash”. Thirty Seven West: “Where do you see your business in 10 years from now”? Lorri Devlin: “Thriving. I envision a school of CapeKids stores in other seaside locales, each featuring unique themes from the area’s natural habitat”. Thirty Seven West: “How did you find out about Thirty Seven West/Labels America”? Lorri Devlin: “I did a Google search, and of all the sites, I found Thirty Seven West/Labels America to be the most attractive and easy to navigate”. Thirty Seven West: “Why did you decide to do business with us”? Lorri Devlin: “No one else compared with your quality, courtesy, and value”. Thirty Seven West: “Can you describe your experience with Thirty Seven West”? Lorri Devlin: “A great experience! I had a lot of questions since I had never ordered clothing labels before. The staff took time to help educate me, and was always friendly and responsive”. Thirty Seven West: “Were we patient? Please explain in your words”. Lorri Devlin: “I decided to change some aspects of my design, and the staff at Thirty Seven West/Labels America worked with me until it was exactly what I wanted”. Thirty Seven West: “Were we enthusiastic? Please explain”. Lorri Devlin: “It’s refreshing to do business with people who genuinely care about customer satisfaction and courtesy. My service representative could not have been more helpful or polite”! Thirty Seven West: “Did we listen carefully? Please explain”. Lorri Devlin: “I felt comfortable sharing my information with the staff. They understood what I needed and were quick to respond”. Thirty Seven West: “Were we friendly? Please explain”. Lorri Devlin: “Yes- it was a pleasant experience, not at all impersonal. I felt valued”. Thirty Seven West: “Were we responsive? Please explain”. Lorri Devlin: “I got fast service and a wonderful product”. Thirty Seven West: “Would you recommend us to others? And why”? Lorri Devlin: “I already have. It’s hard to find kind, professional people selling a quality product at a good price. I’ll be back”!